Antiques challenge. Auctioneers Catherine Southon and Paul Laidlaw continue their road trip, soaking up the scenery of Northern Ireland. It's the nation's favourite antique experts. Welcome to the second leg of the trip. Catherine Southon and Paul Laidlaw. They look happy now, but leg one saw tensions flair. -I thought you were my friend, Paul. -The honeymoon's not even started! Catherine certainly knows what she likes. Oh, I love this. That's super. Laughing boy Paul is an auctioneer who's just as opinionated. -You were nervous at the auction. I'm always nervous. Get used to it. Is it because you have never been against such a good competitor? Catherine started this trip with £200 in her pocket. she's turned it into a respectable £258.80. so has £282 to play with today. that's why they're not wearing one each. I just think, I really do feel relaxed. -This is the life, isn't it? I've never seen her so relaxed. before finally finishing several hundred miles later in Aberdeen. where they'll do battle at auction in Galashiels. Come on, Paul, I'm going to challenge you. Can you buy something retro? Don't put me under pressure! -Don't make me! Don't make me! Oh, come on, Paul. Have a bit of fun. We'll see. Never say never. of County Londonderry in Aghadowey. Sarah Rose Antiques. We're going to get on famously, Sarah Rose and I.
I'm not looking. I'm not looking. Assume there's nothing there, Laidlaw. Assume there's nothing to be bought. -I'm coming back with armfuls. Armfuls! runs the family business with her dad, James. With a mixture of past and future antiques, there's plenty on offer. If you need any help, give me a wee call. Yeah, is that all right, Sarah? Cos I've got my eye on a few things. -As I'm talking to you, my eyes are wondering. Oh, yes, some nice things in here all right. This looks really interesting on the wall here. Cast iron. Is it for being next to a fire for your...? This is a harnen stand. in front of the open fire. and is worth a closer look, I guess. There's, I think, £85 on that there. That's OK. Well, sure, we can have a think about that one. Paul has made his way to Ballynure in County Antrim. for award-winning fantasy TV series Game of Thrones. Paul's come to Bridgend Antiques. A unique type of shop, situated next door to its owner's house. Pleased to meet you. Hector Thompson. This place smells the way I like my world to smell. Beeswax. I dab it behind my ears of a morning. I will lift every stone because I'm meticulous. It looks like some Capodimonte figurines have turned Paul's head. Excellent modelling. They want to be Belle Epoque. -They want to be 1900, don't they? I see a price tag on there. 38 quid. -That's the two, now. That's not one. I'm going to take the first price on anything. We know that. That goes without saying. That's good. So there's no surprises or disappointments here. Just give me the absolute bottom line. -You broke the ice. We're off and rolling. I'm a wee bit in love. I fancy the one on the left. And her mate's not half bad either. I can't lose here tonight. I'm in. On that note, Catherine, what have you found? -There's a little table there. Now, I quite like the top of that table. -I like the detail here. and it was made for the western market. I like the legs, I think they're quite decorative. Is there any movement in that one? That one's actually £68 on that one. Oh, I read the other side, which I prefer much more. -Sorry, that's our code for our book. -Oh, no! I thought that was the price! a rather nice Royal Crown Derby cabaret tea set. What's a cabaret tea set? It's tea for two, is it not, yeah? For me, there's a touch of romance there. Now cabaret tea sets, yeah, you can buy those. Cabaret tea sets with trays are uncommon. by one of the more desirable manufacturers. I think that's pretty seductive. But, at £185, it's too pricey for his purse. -Where do you want to be? -Do you know what? I'm going to make you a cheeky offer. would suggest to many I have lost the plot. But, at 75 quid, I don't think I could do bad. Oh, jeez! Down to two figures. -Are you a gambling man? Oh, jeez, you're not going to pull a coin! -Oh, no! I hate that! That was me taking that well. But that is a good deal. Excuse me. Wait a minute. I think I forgot something. Back in Aghadowey, Catherine's spotted a piece of silver. The rest of it's plate in there. It looks like it's initialled L and S. Levi and Salaman, maybe. Probably about late 19th century. Not a lot to it. It's priced up £12. Ah-ha! The shop owner returns. Hi, Sarah, there was this one other thing. -I mean, just like a simple belt buckle. for the belt buckle and the occasional table. giving that a price of £45, which has to be a snip. -that you'd seen the thing and you thought it was 15. -So he says we'd go down to 35 for you. And this wee one, £10. If I can have that for 30, then I'll take it. What happens if we just give you a wee luck penny back? -Oh, what's a luck penny? -A luck penny's like an Irish thing. the luck with you from Ireland. -And the table, you pay me £33. -So the table was in fact £33? and that will give me another bit of luck. the occasional table and the silver buckle bought for £83. Wow! Paul's found a pair of early 20th century evening bags. Just what can these be? They cannae be £15. That's not working for me. on my lost shot on the way out the door? -That hinge is a wee bit iffy. And that's no use at all. Give me your hand and we'll have a deal at a fiver. -We got a deal at a fiver. You know what I'm going to buy now? I've got two more things to buy for this auction. So that means Paul has paid £110 for his haul of three items. and has travelled to Bellaghy in County Londonderry. it's here that the late, great Seamus Heaney grew up. as the greatest Irish poet since WB Yeats. And he had a good line in hats. and old family friend Fergal Kearney. you're very welcome to the Seamus Heaney library in Bellaghy Bawn. from his school bag to his duffle coat. in memoriam now to one of our greatest 20th century writers. of the area that inspired Seamus' poetry. but when did that really start? I think it goes back to his very early childhood. as Seamus Heaney was when he was growing up. a beautiful place to actually create words of lyrical beauty. to St Columb's College in Derry. much of which focused on his childhood memories. a reflection on the death of his four-year-old brother. He ends the poem, "Next morning, I went up into the room. "Snowdrops and candles soothed the bedside. "I saw him for the first time in six weeks. "Wearing a poppy bruise on his left temple. "He lay in the four-foot box as in his cot. "No gaudy scars, the bumper knocked him clear. "a foot for every year." -Gosh, that really hits you, doesn't it? that remained close to his heart throughout his life. I mean, he achieved wonderful things. He was a professor at Harvard. He was a professor at Oxford. -But it comes back. Exactly. That's what it comes back to. and his last wish was to be buried in Bellaghy. and subsequently enriched ours through his work. -But it's been wonderful. Thank you so much. Paul, meanwhile, has made his way to Belfast. it was awarded city status by Queen Victoria in 1888. But Paul's not here to soak up the culture. He's here to shop. -Hi, Paul. Welcome to Belfast. Good to see you. Thank you very much for the greeting. a bit stand-out, at the right money. What's that, with the trigger? -It's not silver, though, is it? That's not the prettiest I've seen. So what is it, Laidlaw? It's a tiny little gardening shovel for leprechauns. it's a Stilton scoop. OK? So, when one delivers the Stilton to the table, you need this. I like that. It's cool. £25 would show me a small profit. But I'm going to have another wee mooch about. coming out of Scotland. Monart and Vasart. Well, we get the use of what's called aventurine glass here. See these metallic, sparkling inclusions here? and the lovely contrast between the two types of glass. dating to the 1930s, '40s. £22. Is there a deal to be done with Laurence? You can walk away with that one for 20, if that helps you. I'll bid you a tenner on that. Are you Scottish, by any chance? Meet me halfway. 15 quid. It's going to a Scottish auction and it's 15 quid and it's sold. -What do I owe you? 15 quid... Remind me. I owe you 40 quid. Then I'm out of your hair. we say nighty-night to a busy day of shopping. What fun. -How'd you get on yesterday? It's the knowing laugh that you did. Uh-oh, they're at it again. leaving her £175.80 to spend today. the ladies' handbags, the Stilton scoop and the vase. He's got £132 burning a hole in his pocket. hoping to uncover some splendid buys. Wow! This is much bigger than I thought. -Hi. Catherine. You must be Heather. Hi, Heather, lovely to meet you. -It goes back a long way, doesn't it? -There's plenty to look at. There is an awful lot to look at. But as soon as I come in I see lots of smalls, which is lovely. I'm seeing in there that you've got a little belt buckle. and I'm thinking I can maybe put the two together. -Because so often these are reproductions. And that's quite nicely chased, isn't it? Right. What would you do on this one cos you've got 68 on that? I'll do it for 60. Is there no way you can do a bit more on that one? It's dropping an awful lot. That's lovely, isn't it? That book slide there with the fans on. It's all lacquered with mother-of-pearl inlay on it. I don't really like book slides, they're normally terribly boring. It's something I've never, ever bought, actually. But that's actually really nice. With a price tag of £120, do you like it enough? What would be your very best on this? Well, it really should be 100. Can we say 80 on it? because I do like that. -I shall shake your hand. Thank you very much. That generous discount means Catherine parts with £120. before he was out of his teens. Here to tell Paul more is house manager Matthew Morrison. This was the home of Captain Shelton. He was a survivor of the Birkenhead disaster in 1852. This is really significant in terms of maritime disasters, is it not? before the sinking of the Titanic. which is the women and children first were to be evacuated. -So quite an important event in our history. it's only ever been used officially twice in history. Once on the Birkenhead and then again on the Titanic. -So it's not as common as we think. that Shelton set off to fight in the Cape Frontier Wars in South Africa. He travelled on HMS Birkenhead. where women and children would have travelled along with the officers. They were there to act as nurses and cooks to the men. while travelling around the Cape of Good Hope, disaster struck. The ship hit a rocky outcrop called Danger Point. Shelton was fast asleep below deck. -and, at that point, they were all called on to the deck. and they were very distressed. Deary me! It's horrific quickly, isn't it? the ship continued to flounder. of "women and children first" was issued. and make sure all women and children had evacuated safely. we can actually see Shelton with the two young girls that he saved. -where their mother hysterically waited for them. Now, like the Titanic, there's not enough lifeboats, are there? in launching those that were workable onboard. And we believe there were several that actually made it safely away. and ordered his men to stand fast and remain on the ship. and sank only 20 minutes after hitting the rocks. So what becomes of Shelton in all this? -He's aboard the vessel as it's going down. Shelton was actually offered a place on the lifeboat to save his life. and he chose to stand with the men and go down with the ship. Death by drowning came quickly to many of the men. The more unfortunate were killed by great white sharks. Shelton however survived, enduring a terrifying three-hour swim to shore. Our story doesn't end with just Shelton surviving the Birkenhead. his own horse went overboard and into the sea. -and the two had survived the swim. And this is the horse here which he brought back here to the Argory. It was known as the Birkenhead Horse. Of course it was. That's astonishing! but it's estimated nearly 450 men lost their lives. and diplomatic career before inheriting the Argory, aged 34.
but he never forgot his brush with death on board the HMS Birkenhead. Well, I'm delighted to have visited the house that clearly he cherished. -I'm indebted to you, Matt. Ballinderry Upper in County Antrim. -Are you ready for this? Are you ready? and it's Paul who's first to find something. The first thing I pick up is a Georgian firing glass. Wait a minute. Did he say firing glass? What on earth is one of those? and early 19th century drinking clubs and societies for toasting. Imbibe. And then slam the glass down on the table in unison. It'd go off like gunfire. Develop glasses specific for toasting. and a heavy, heavy foot with a heavy, short stem. And that's what we've got there. I'd have a budget of £80 in mind. Price tag on this says £28. I think we'll keep this in mind. But I've only just started. Catherine's downstairs with dealer Donald. doing like the alphabet or numbers, embroidering them. so we've got "Ann Thomas, aged 9 yrs." Dated 1867. But what I like about this one is it's pictorial. I think these are the ones that sell for more money. Can we say £35 on that? No, I couldn't. £40, that would be. Yeah? -That's the end. Let me shake your hand. Right, Paul, decision time on that firing glass. I can't resist a nice piece of glass. Would you sell me that? Talk about blink and you'll miss it. A speedy deal on the firing glass for £20. And, just like that, both our experts are all bought up. the silver buckles, the unusual book slide and the Victorian sampler. the glass baluster vase and Georgian firing glass. for £40 is the best advert imaginable for entering our world. I never thought Paul would go for the Crown Derby tea set. And I didn't really think he would go for any Capodimonte figures. And I definitely didn't think he would go for handbags. and that saves my bacon. But I tell you what I do really like is that super Stilton scoop. where they're motoring towards an auction in Galashiels. This is your sort of territory, isn't it? to a...to a...to a highlander, Edinburgh doesnae count. your really strong Scottish accent is coming out. I haven't got a clue what you've just said in the last five minutes. at Hall's Auctioneers and Valuers then. -It's right by the river. This is lovely. so what does he make of our experts' lots? I think the sampler is probably the best of the items brought in. There's so much going on in it and it's got a nice strawberry border. which helps all these items, condition-wise is important. Settle down, folks. How are the old nerves, Paul? I know. I can feel it. I can feel the vibration of your knees. First up, Catherine's Indian carved occasional table. £10 for the table. 10 for it. 10 is bid. At 10 for the table. Any more at 10? At £10. More, surely, there's a lot of work in it. Are we all finished? It will sell at 10. At 10. Looks like the luck penny didn't work after all. That was your weakest link, put to bed, move on. From now onwards, it's stratospheric. And fitting, as your riskiest punt is up next. The tea set. This is my risk. This is it. I can start it off at £16. I have £16 against you. Och! He's going up by the pound. You've got two people bidding on this. At 31. 32. 33. 34. 35. 36. Pound by pound bidding, we could be here for a while. You're doing it. This could really climb. Oh, hang on. He's going up in £2 now. How did you start at £16 and get up here? How did you do that, Paul Laidlaw? At £90. All finished? £90, it goes now. Oh, well done, you. That's brilliant. I've survived it. I'm still here. Thankfully, that's a profit for Paul after all of that. Who needs their oatcakes toasted, eh? Catherine's harnen stand is up next. We'll start at 5, then. 5 is bid. At £5. Any more at 5? At 6. 7. 8. 9. 10. 11. £17. Any more at 17? I'm getting a hot sweat here. In the right, room that niche item might have faired better. Maybe glass is more this crowd's thing. 16. 16 in the room. At 16. -Just amazing. How do you do this? It's picking up pace again. 42. 44. 46. 48. 50. 2. 54. 56. 58. 60. 2. 64. -Do you want to swap it? At £64. All finished, then? Ah, it might take a while, but that's another top result. I've warmed to this auction, I don't know about you. -This is a good auction. Right, can Catherine make a comeback with her book slide? Beautifully displayed. Look at that. -If you want one, this is it. The phones are ringing. See? The phones are ringing. They're all phoning in from across the world for the book slide. At £20. At 21. 22. 23. 24. 31. Any more? At 31. 31 in front here. At £31. At £31, any more? At £31, then, it goes. That's so cheap. That was cheap at 31. Is that the reek of smuggery I smell, Paul? -I'll buy you a big cake after this. -I'm going to buy you a big cake. -If it's a really big cream cake. There's the Laidlaw we know and love. Time for your firing glass. 16 in the room. At 16. 19. 20. 1. 22. 23. 24. 25. 26. 27. 28. 29. 30. £30. At 30. Any more? 30 for the old wine glass. At £30. At £30, all finished, then? It's going at 30. Will his Stilton scoop see him fly further into the lead? 38. Any more? 38. 39. 40. 1. 42. 50. 1. 52. 53. 54. 55. 56. 57. 57, any more? At 57. My goodness me, Paul! That's fantastic. Nearest to me is 61. 61. 62. New bidder. All done, then? Going. Last time. We have the whole of the Stilton Cheese Society here today. They are all bidding on that. Paul really has bought well. Can Catherine redeem herself with her silver buckles? -20 is bid. £20. 22. 24. 26. 28. 30. 2. 34. 36. 38. 40. 2. 44. 46. Yes! No, don't stop. Please, don't stop. For the silver buckles. At 46. All finished? -Oh, it's worth more than that. OK, it's two cream cakes. Time for Paul's impulse buy, the beaded handbags. You might have made yet another great profit, but we're not done yet. And up next are a couple of your muses. At £20. 22. 24. 26. 28. 30. 32. 34. 34. Any more at 34? Are we all finished? At £34, then, they go. It's a shame, cos they deserve to do a lot better than that. Hey, that's still a nice little profit, Paul. This is it. This is my last chance to claw back SOMETHING today. It's the auctioneer's personal pick, Catherine's sampler. -I can start the bidding on the sampler at £50. At £50. Any more at 50 for the sampler? For 55. 60. 65. 70. 75. At 75. Any more? At 75. Are we all finished? 75. It goes, then. -Short and sweet, but straight in. I bet you are. A well-deserved profit to end on. Hot date with a big cream cake. Oh, yeah. Come on. Please, Paul. Come on. Before cake, let's talk money. Catherine started this leg with £258.80. and goes into the next leg in the lead with £372.76. I DO buy the brooch? And Paul gets to know Mr Pastry. Auctioneers Catherine Southon and Paul Laidlaw continue their road trip, soaking up the stunning scenery of Northern Ireland. 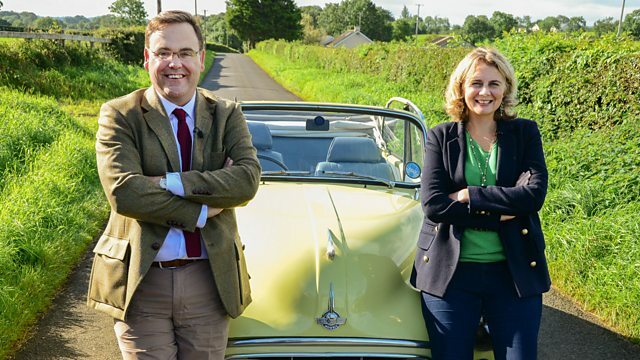 Starting from Aghadowey, County Londonderry, will the luck of the Irish be with our antique experts as they try to uncover some hidden gems to take to bonnie Scotland, where they'll do battle at auction in Galashiels?